Earlier today, Facebook filed a patent for “a self-balancing robot that transitions from a three-wheeled mode to a two-wheeled self-balancing mode” with the United States Patent and Trademark Office. Facebook isn’t typically thought of a as a hardware company, and the details on what this is intended to do are left vague. The included illustrations depict several configurations, but the core functionality is that bulbous thing at the end of its multi-jointed arm, which the patent refers to as “the head unit.” The unit is designed to support a display, camera, microphones and a speaker. Perhaps it has VR applications, but the on-board tech seems geared towards a telepresence play from the Zuckerberg empire. The patent also notes that “in some embodiments, the body can be configured with a storage region or a cargo support to carry items when the robot is in a three-wheeled mode,” which brings to mind personal delivery applications as well as butler bots like Piaggio’s Gita robot. 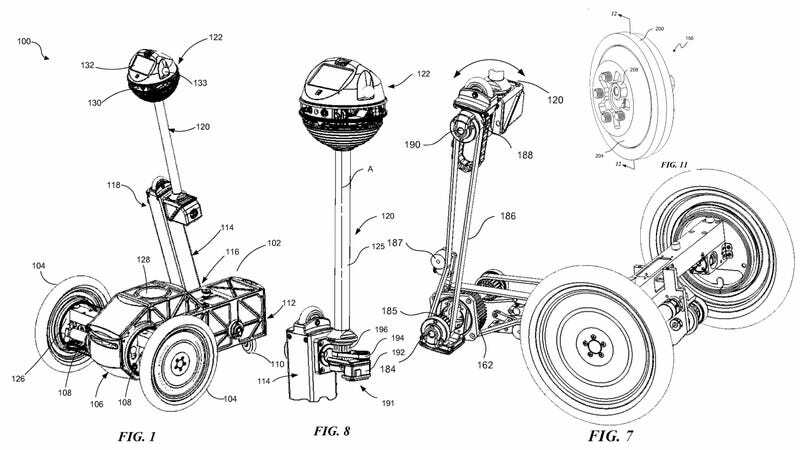 Of course, this is only a patent filing and Zuckerberg may never build fleets of these Segway-looking bots. Still, with Facebook’s overwhelming reach online, there’s something a little unnerving about watching it extend into the physical world.